Looking for past articles on Tambour Embroidery here on Needle ‘n Thread, all conveniently located in one place? In an effort to keep popular topics and projects organized on Needle ‘n Thread, I like to create separate index pages for each group of articles. If you’re following a particular project or technique that’s indexed, you can always bookmark the index page for easy reference. 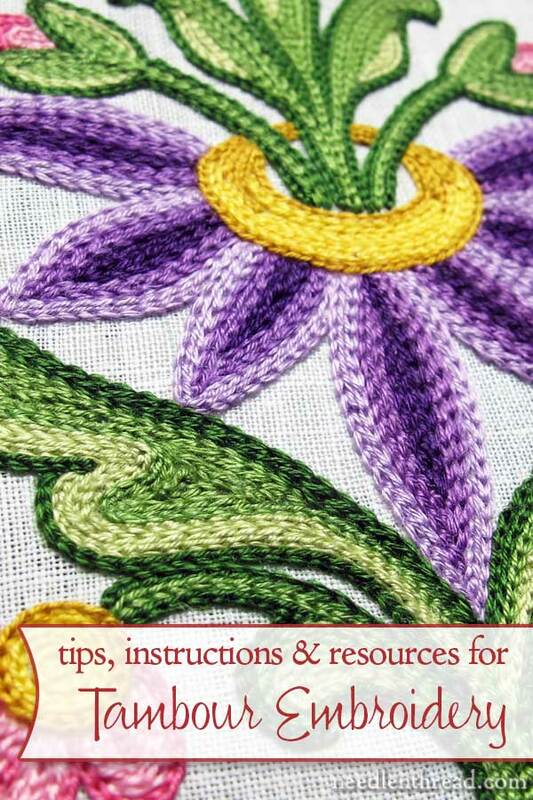 You’ll find all the index pages for various article groupings, techniques, lessons, and embroidery projects listed under Hand Embroidery Lessons & Step-by-Step Projects on the Tips & Techniques page in the top menu on the website. The Tips & Techniques page is chock-full of articles helpful for beginners and beyond. If you’re looking for notable previous articles on Needle ‘n Thread that are instructive, you’ll find many of them listed and categorized there. It’s a good place to browse, especially if you’re just getting familiar with the website! All articles relating to tambour embroidery will be listed in this index once they appear on the website. The index is arranged with the most recent articles at the top of the list. If you’re looking for other fun embroidery techniques, projects, or lessons, feel free to browse through the Tips & Techniques page on Needle ‘n Thread! That’s a great idea to put all the posts in one location I do really like Tips & Techniques on Needle n’ Thread as it’s so helpful whenever I have want to find out about a particular aspect of embroidery I always look on Tips & Techniques first and most of the time I find what I am looking for. So thanks for organising Tambour embroidery and putting it in one location. This is SO awesome, Mary. Thank you, thank you! Thank you for organizing your tambour posts. I love your website and use it all the time. Can’t wait for your tutorial on tambour embroidery. There is nothing so helpful as a good video with clear comments! Thank you!! Don’t know how my technique had gotten turned around, but I thought you had to work with the hook facing in the opposite direction. It is _hard_ to pull up a loop when the hook is facing the forward line of stitching %^p I kept thinking “why is this so complicated and snaggy? Why wouldn’t this be like crocheting through a piece of paper?” and that is pretty much what you’re showing, isn’t it. Again, *thank you*!! I’m interesting in trying tambour embroidery & I’ve ordered a tambour needle. Can you give me some specific examples of canvases or fabrics used in tambour embroidery. On your excellent tutorial video it looks a little like you’re doing it on embroidery or needlepoint canvas. But elsewhere you talk about fabric. So what are some good options for a beginner to try? (ideally canvas or fabric that is readily available). Also, I know you recommend DMC coton a broder #25, but I was wondering what threads would you recommend I try that are easy to find (or better yet, that I might already have in my needlepoint stash). I want to learn how to do tambour embroidery & make sure I like it before I invest in the types of canvas & threads that are optimal but may be more expensive or as readily available. Thank you so much for you excellent blog & the variety of excellent information & inspiration that you regularly provide. Hi, Sharon – any fabric and any thread will work. If you have cotton muslin on hand, that’ll work. If you have regular floss on hand, it’ll work! Tightly twisted threads are a little easier to work with, I think. If you have tatting cotton, for example, that would work well. I’m using linen for the ground fabric in the flower and bird project (and the leaf border on the towel – that’s a linen towel), and it’s all fairly high count linen. The only reason it looks like needlepoint canvas is because the photos are so up close. You can use any fabric for tambour work, Nancy. In the demos here, I used netting (cotton tulle) on the video (so that you can see what’s going on up top and down below). For fabric for the bird and the leaf design and the flower, I used linen. I’m trying this out and it’s very frustrating. Does it matter what type of fabric I use? And every time i thread it from the back and try to bring it up, it just doesn’t work right, i can’t seem to bring the thread up without bring a piece of thread from the fabric up as well. Should I pre poke holes in the fabric? Hi, Raven – it helps to push backwards on the hook – so push against the fabric, using the backside (non-hook side) of the needle as you pull through. If you’re still having a problem, try switching to the next size up on the hook and see if that helps. But I think the key is pushing backwards on the hook as you pull the thread up from the back. It takes a bit of practice to get going smoothly with tambour work – I practiced random lines and curves a half an hour a day for a couple weeks, before I could really weird the needle comfortably without hang-ups. Keep practicing!! Hi, I’ve been practicing with my tambour needle, however even by following your very useful videos, I find myself stuck because I can only use one thread and I would like for my creations to have a thicker look. How can I achieve this? Do you have any suggestion? Let me know! Thank you very much! Hi, Martina, I’d probably try a heavier thread with the largest hook. It’s more difficult to add strands, because they catch on the needle. I love the look of tumble. Would love to learn this craft. Do you have anymore videos. Also thank you so much for sparking up my new year. Robert Haven has a ton of tambour vids on YouTube. Previous Previous post: Needlework Tool Caddy – Winner Announced!